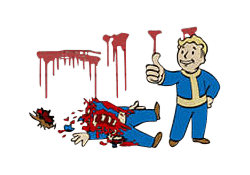 Bloody Mess is a Perk in Fallout 4. It is associated with the Luck Stat. Rank 1: +5% bonus damage means enemies will sometimes explode into a gory red paste. Watch out for flying eyeballs! Rank 4: When an enemy explodes, nearby enemies may suffer the same fate.